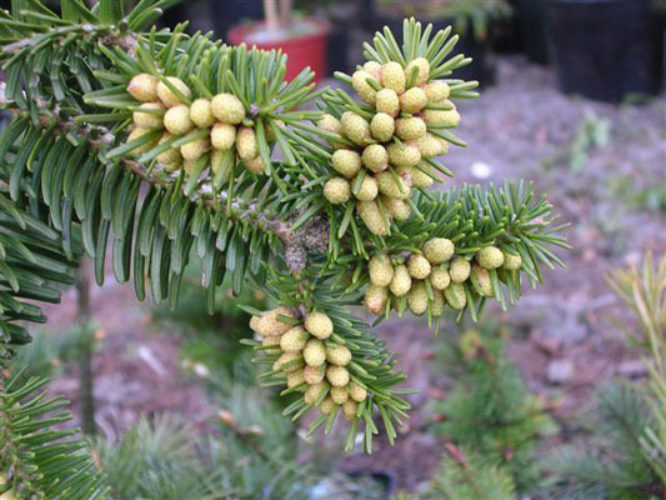 Abies × vasconcellosiana, also known as Portuguese hybrid fir is a natural hybrid of west Himalayan fir (A. pindrow) and Spanish fir (A. pinsapo). J. do Amaral Franco found it in 1945 in Pena Park, Sintra, Portugal. Description. Portuguese hybrid fir is a large tree which will grow to mature heights of 60 feet (18 m) or more. Its needles resemble those of A. pindrow, but are shorter and blunt, 0.8 to 1.2 inches (20 - 30 mm) long and 0.08 to 0.1 inch (2 - 2.5 mm) wide with a few stomatal bands beneath. The seed cones are cylindrical in shape, 4.7 to 6 inches (12 - 15 cm) long and 1.6 to 2 inches (4 - 5 cm) broad, dark purple in color when young, maturing brown. Abies x vasconcellosiana — foliage and pollen cone detail.